Manufactured with the highest quality of material and workmanship. Available in blue, one size fits all. Manufactured with the highest quality of material and workmanship. one size fits all. Black nylon capris with drawstring & low cut waist. High quality nylon fitted vest with zip-up front, back pleat,flaird at the waist and mandarin collar. 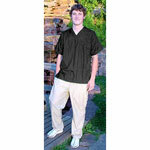 Come with assorted embroidery on left side of chest. Available in black.